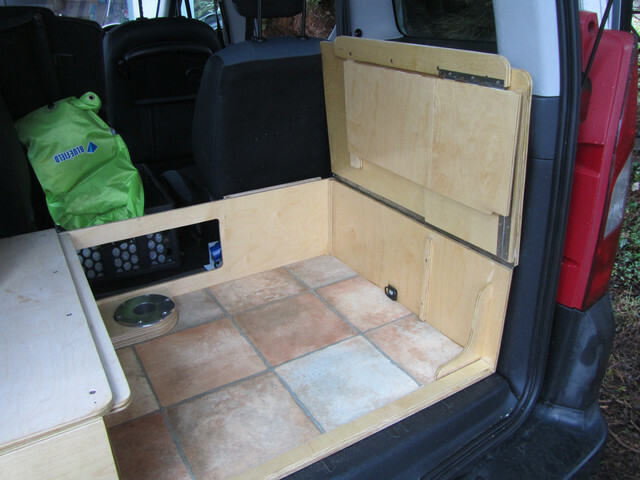 This is my take on a camper conversion I am building for my 2008 B9 Berlingo Multispace. I started it at the beginning of November and it's now almost finished. If there is any interest here, I can show a step by step build with photos. I started with a few sketches that evolved into a set of criteria that it had to meet. 1. As our Berlingo also does duty as a runabout, and my wife is disabled, the unit had to be easily installed and removed by one person. Not so easy - try lifting an Amdro (or clones) in or out by yourself, and you'll see what I mean. In the end I was successful, but only just. 2. I wanted power for lighting, a coolbox, phone and tablet charging, a bit of heating, and other uses, and I decided to do this without touching the car's electrics or using a leisure battery. 3. 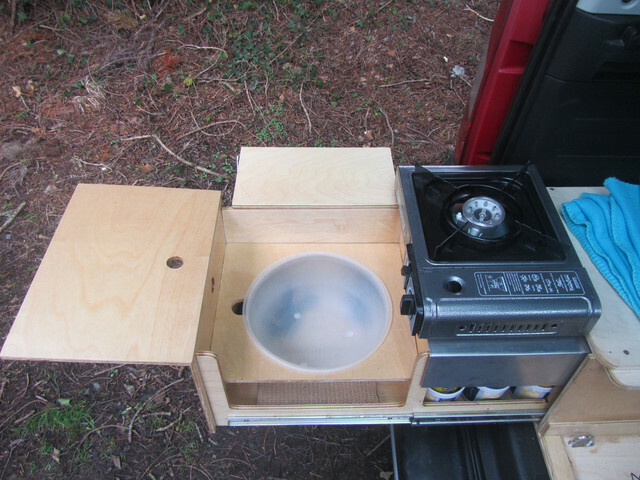 There had to be a toilet, ultra-simple basic cooking and water supply facilities, plus a full size bed. 4. There had to be comfortable seating at a table, with generous legroom. This last requirement was a must, and most of the double box type units are very tight on legroom.The storage was needed but the cramped legroom was not. 5. An easily erected tailgate awning was part of the overall plan, otherwise the whole thing would not work as I wanted it. 6. And cost came into the equation of course. 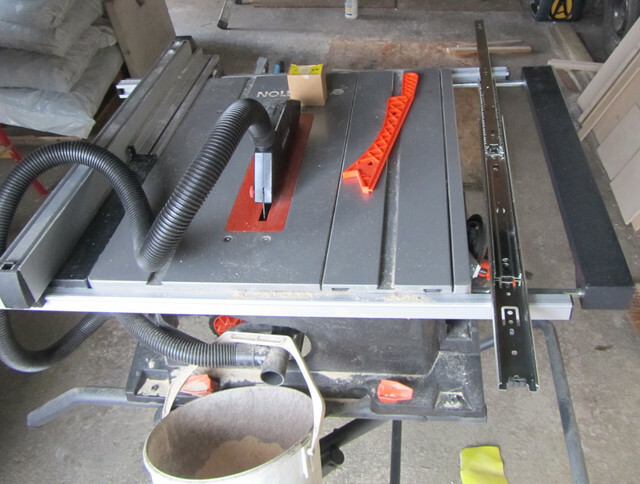 First, a sawbench with which I was able to cut 8' x 4' plywood sheets. 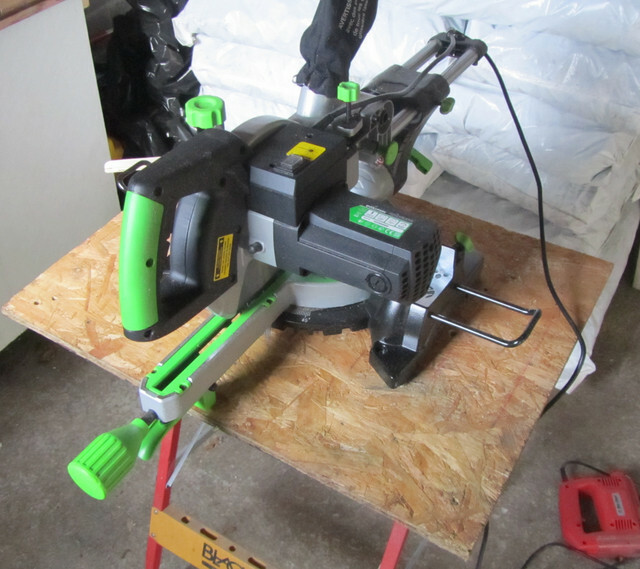 Then a sliding mitre saw for more detailed work. First, I examined several commercial units together with a number of self- build units. The rear two box style seemed to suit our needs best as this left the standard seating in place for every day use, but I modified this layout for our personal needs. Some units I looked at were constructed from untreated plywood, and I reckoned that it would get easily marked and scuffed, so that was an area to sort out. One or two had a carpeted floor to the seating area, which looked very homely but difficult to keep clean, especially in off grid situations where we might camp. The height of the seating unit was also critical. Those I'd examined left the sitter bent, with his head up against the Berlingo roof, and the table far too high in relation to the seating height. I wanted the lowest possible seat height, commensurate with a flat bed, and if possible I wanted the entire unit to fold up below the standard Berlingo boot cover, out of sight. 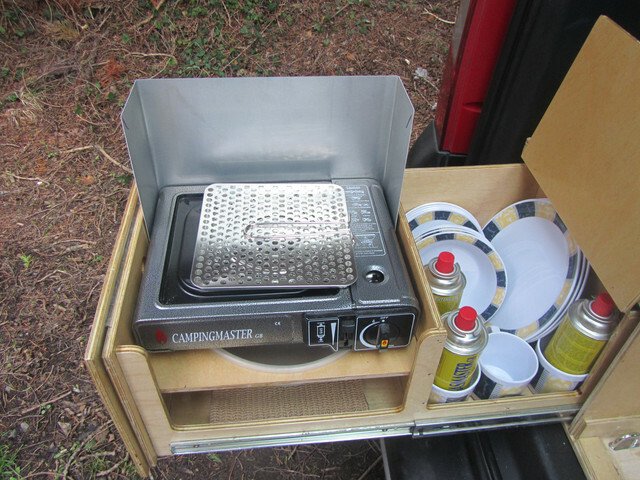 The single leg table support, allowing for a swivel table, seemed a good idea, but the available leg kits were obviously meant for larger campervans with higher seating and more headroom, so that feature needed some thought. With all this going round in my head, I gradually realised that I needed to consider the car, a suitable tailgate tent, and the unit I was constructing, as one integrated package, and this led to a few compromises. 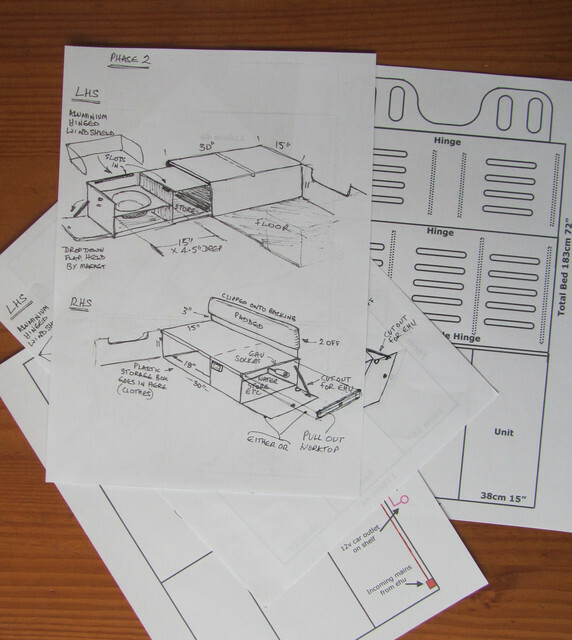 Rough sketches came first, then decisions as to dimensions, materials and features. 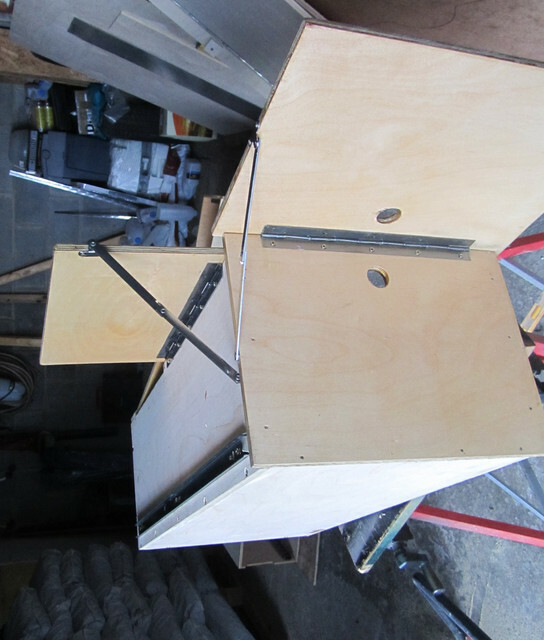 The build is now coming to a conclusion and the end result is a little different from the initial sketches! More later if there is any interest. Hi Gravity - I'd love to see more too please. I've been mulling over a self build setup for a while and have got various bits ready to fit in...and looked through all the old camping box posts...so more info please! Come on don't tease us bring on the photos, it sounds like a good plan I for one would like to see the finished article. An early decision was made to remove the centre rear seat whenever the unit was installed. The centre seat has a built in tray with cup holders for use when it's back is laid flat, and this makes it higher than the seats either side. The tray is plastic and can be unscrewed from the seat back, but I needed the space, so the seat was unclipped and removed. There are similar trays in the seat backs of both front seats, so I can't see the point of this extra one. This gives me a 'tunnel' from behind the front seats right to the tailgate. I thought that this would help with ventilation and heating when the bed was in use. The car has been so much more versatile with this seat removed that it now stays out permanently. 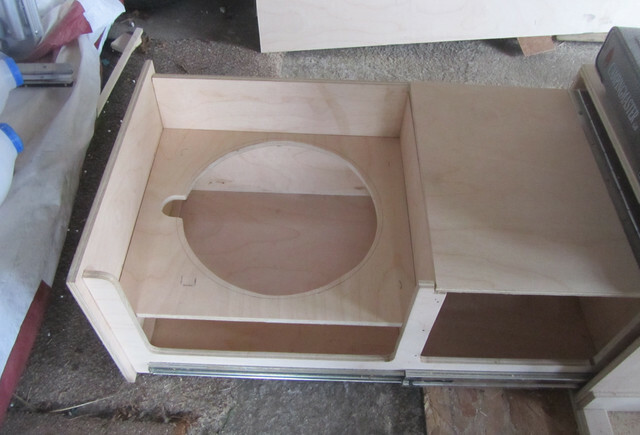 Here is the layout just after I cut the base to size and fixed the rear panel. This was made in 9mm ply. 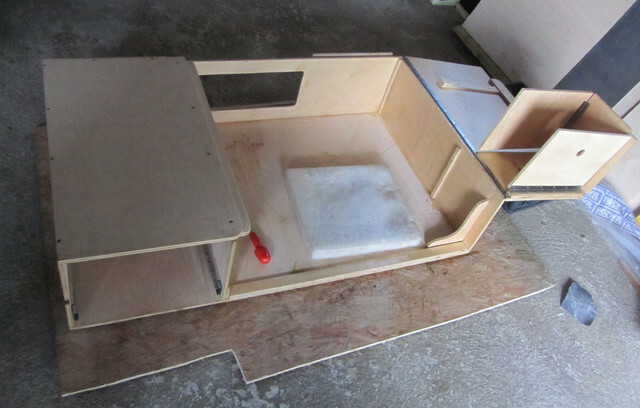 In fact, 9mm ply was used for the entire construction, except for the bed panels, for which I used 12mm ply. This has proved a good balance between rigidity and weight, and there seem to be no downsides. 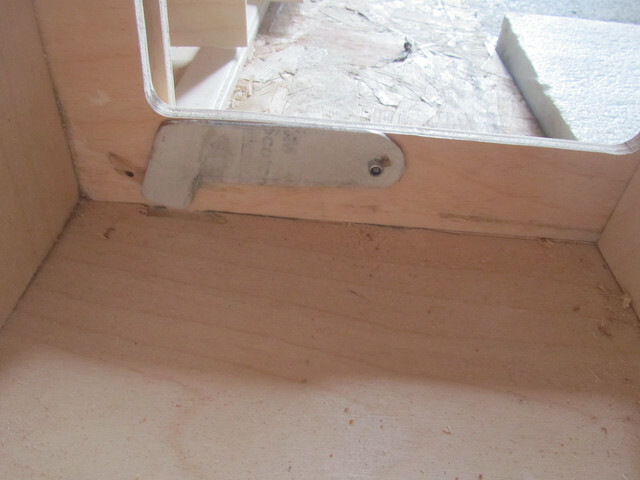 I am definitely no carpenter, so all joints are butted or lapped, glued and screwed. It has turned out immensely strong. You can see the centre rear seat still in place with the plastic tray fitted to it. This seat was removed as the build progressed. The cutout on the rear panel has given me front-to-rear access, and has maintained the rigidity of the structure. Also my proposed ultra simple water storage shows, alongside a folding plastic box. 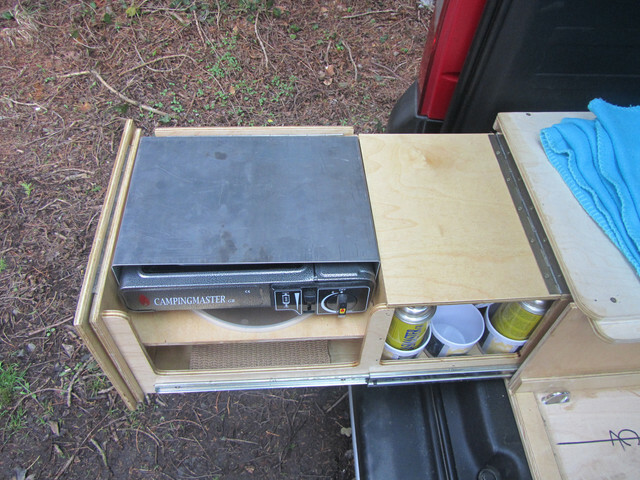 The right box was made so that it was a storage unit when the bed was folded down on top, and it also folded flat and swung out of the way when the rear seats and table were in use. Try sitting comfortably in an Amdro or similar with the permanent two box construction and you'll see the reason. You need the feet and legs of a midget to get comfortable. The foldaway right box gives plenty of foot room for two people. It also means that they don't have to sit bolt upright. All surfaces that may get scuffed are being given two coats of satin marine varnish. The centre panel here is obviously going to be the table, so that is getting another coat or two - still being done. 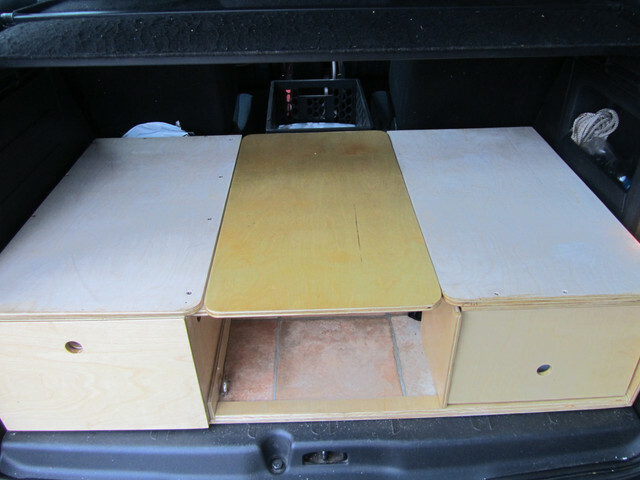 Here's the available floor space with the right hand box folded flat against the boot wall. Plenty of lounging foot room. It's just propped here for the photo, but a strap will hold it in place. The strap also has a second purpose - see later. All surfaces of the folding box get two coats of varnish. Vinyl on the floor - looks good and easy wipe. Now to work on the main storage drawer - left hand box. Hope all this gives someone a few ideas. Bear in mind it's just my individual take - not suited for everyone I'm sure. I was a bit wrong there - the left hand box is the main 'kitchen' area, but not the main storage unit. 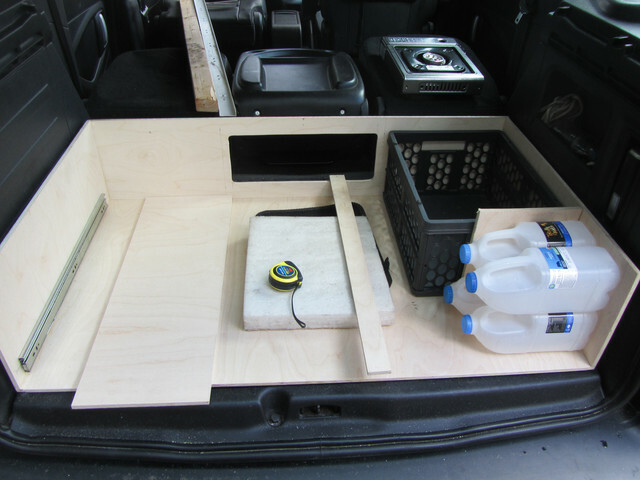 The Berlingo has several other areas that can be adapted for storage. One problem with all the gear you need for a small camper is where to put it when it's not in use without making the inside look like a tip, with stuff getting in the way. Here's a few photos of the 'kitchen' box. It's still being developed but the layout is clear. It locks the drawer fully open. That's on the inside of the crockery drawer, and is easily pulled up when you want to close the drawer. It's now been smoothed off and painted black. 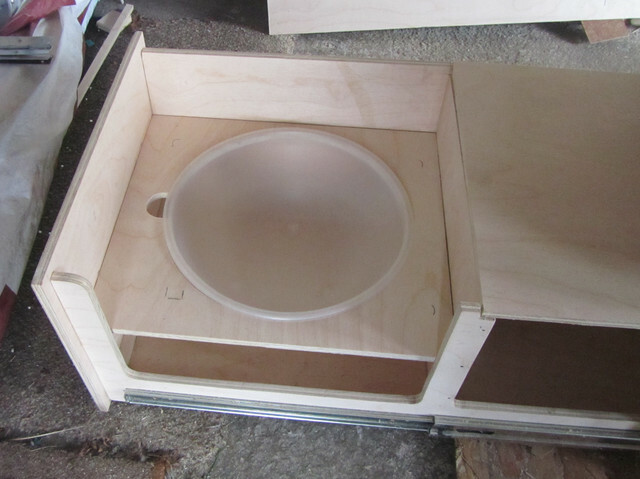 The round plywood for the bowl is just dropped in and sits on a three sided ledge. 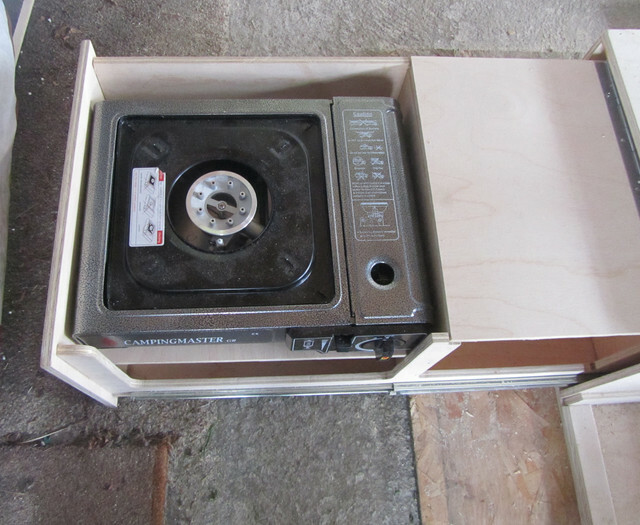 Both the plywood and the bowl are easily removed - for cleaning and also in case I change my mind and fit a more fancy water system later on. Test fitting the bowl in place. My wife has accepted the loss of her old plastic mixing bowl! All surfaces in these photos have since been given two coats of satin marine varnish. Would welcome your views or ideas - this is still a work in progress. Not wanting to do much cooking, I'm using a single burner hob. It sits over the water bowl when I'm using it. It's covered with an aluminium panel when the drawer is first opened. This panel becomes a large windbreak by slotting in behind the gas hob, because there’s not much energy in the gas flame and any wind would soon blow the heat away. Since this shot I've rounded off the corners of the panel. See the toast maker also in this photo - great little piece of gear, that makes brill toast! The crockery section has a hinged lid - I found this much more convenient than a fixed cover. 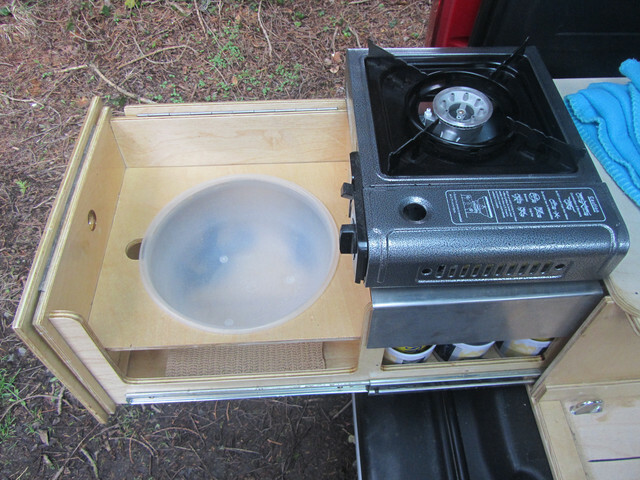 Since these photos were taken I have soft lined the space under the bowl and spare gas cylinders are now stored there. The crockery sits tight in its own space. No rattles sport! I was surprised that there was room for the rear flap on the side of the drawer without it fouling anything as it closed - should have made it bigger.